perhaps because his father wanted him to be a poet and his mother wanted him to be a bishop in the evangelical church, john ruskin compromised and became a fire and brimstone art critic, a combination of john leonard, pauline kael and michiko kakutani in influence and breadth of reign. 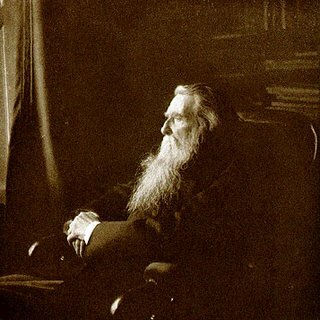 his word could make or break an artist, and ruskin was never one to hold his tongue. 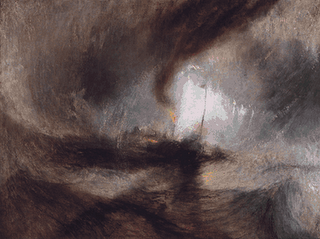 where others critiqued turner's 'snowstorm' as a mess of 'soap suds and whitewash,' ruskin declared it one of the best depictions of the sea ever painted. when ruskin declared that after raphael, painting in england had gone off-track, an entire movement, the pre-raphaelites, was born. 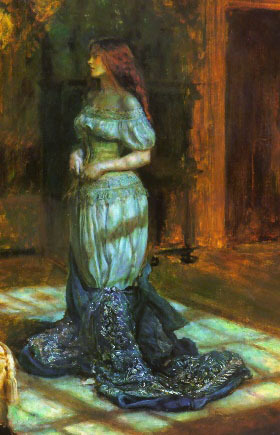 though ruskin was perhaps closest to millais, reviewing his work most favorably, all of the pre-raphaelites became ruskin's family symbolically. 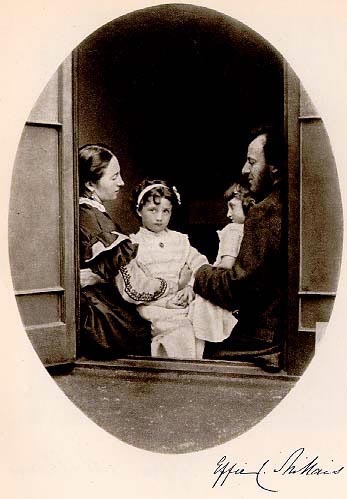 literally, euphemia chalmers gray became his wife. this peaceful moment, however, was not to last. 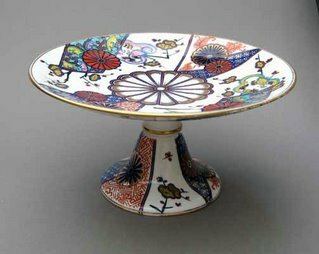 though he had reputedly written of his appreciation for japanese art, when it began to 'invade his territory' ruskin began to decry it. the bitter depressions and madness that were to fully take over his later life began. 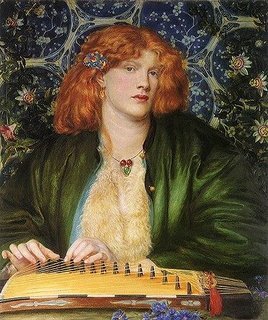 one wonders what it was that whistler did to him personally, though perhaps his slow yet persistent influence over artists that ruskin felt he used to 'rule' (particularly millais, whose 'eve of st agnes,' above, was said to be influenced by whistler's 'white girl') was enough. perhaps he simply did not pay 'the great man' the homage he felt he deserved. 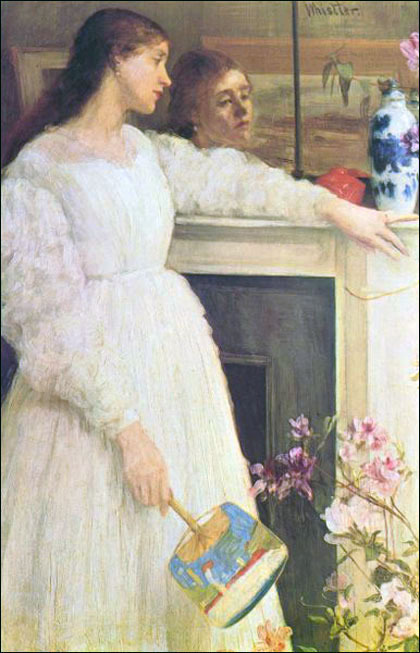 whistler sued, and won in court (ruskin was too ill to attend), but he won but a farthing, leaving him bankrupt. both he and ruskin were exhausted and destroyed by the battle, ruskin abandoned to a life of manic-depression, hallucinations, and heartbreak (having fallen in love with a 10-year-old girl), whistler needing to begin his life anew, with nothing. 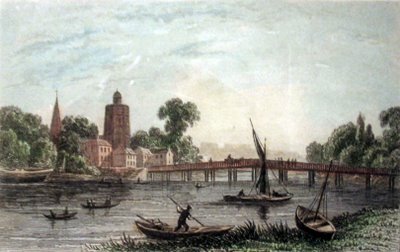 i started thinking, hmmm--whistler's painting does say old battersea bridge... maybe the one in the photo is the 'new' one. sure enough, in this print made in 1840 by thomas dugdale, we see the old battersea bridge, replaced in the 1880s. THAN THE NEW ONE DOES! there will be much more about this, but that comes later. i'll take this story one man at a time. 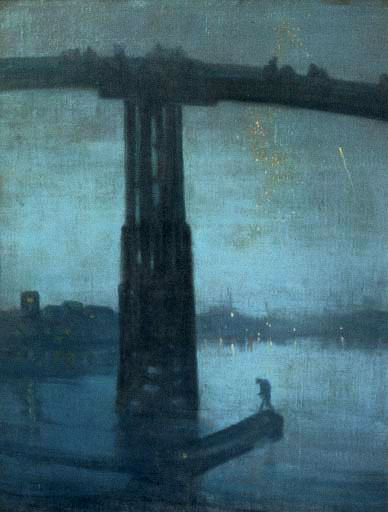 whistler the painter became enamored with the art and craft of japan to such an extent that he became one of the influencing factors in the lives of many european painters and collectors. what he saw as the essence of the japanese ideal: a rootedness in nature, and 'art for art's sake.' a battle had raged in europe over whether or not art must be moralistic. 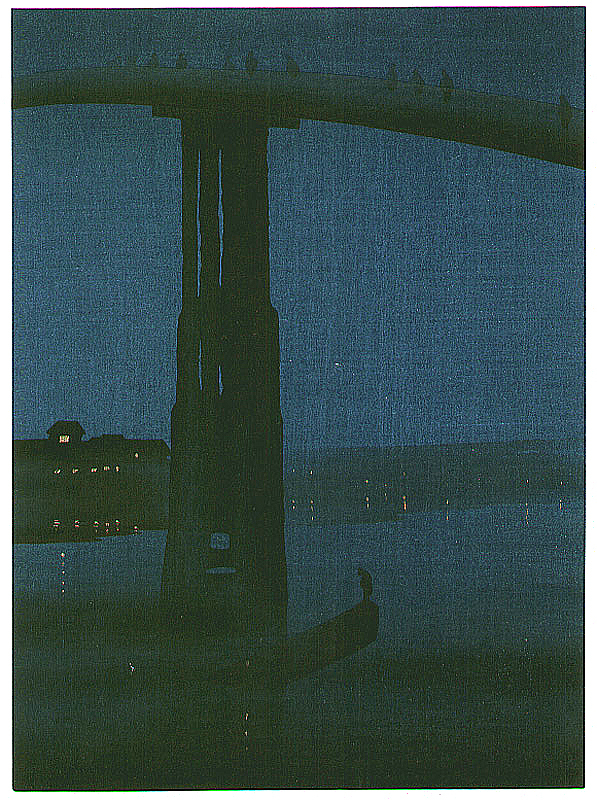 whistler said no. 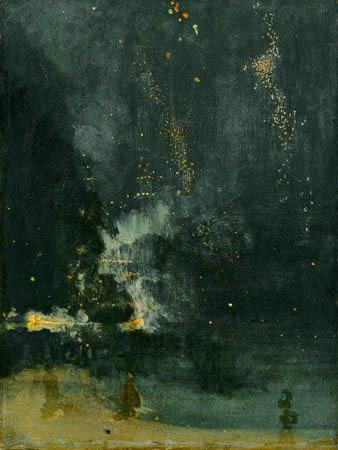 the very naming of his paintings for forms of music, symphony, nocturne, reveals this in that he hears the lights and darks, the forms and the flow of line and pigment, and this is what's important (in this i assume that whistler, like nabokov, was a synaesthesic). 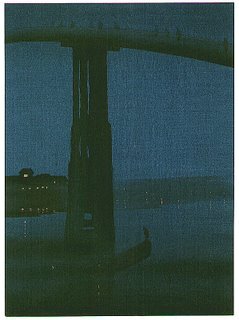 this second one (left, above) is called 'nocturne in blue and gold: old battersea bridge' and it was painted in 1873. but, in honor of this blog's topic, let's look at some other images, and their dates. 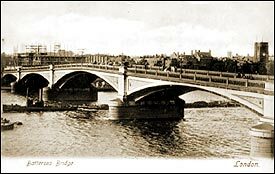 now the interesting thing is that the photo is the battersea bridge. 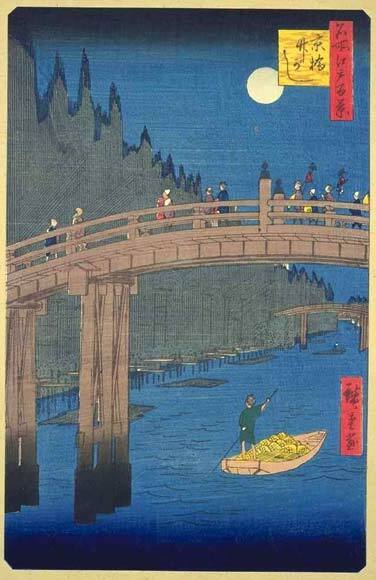 and just below it is the kyo bridge, in a print made by hiroshige in ca. 1857! 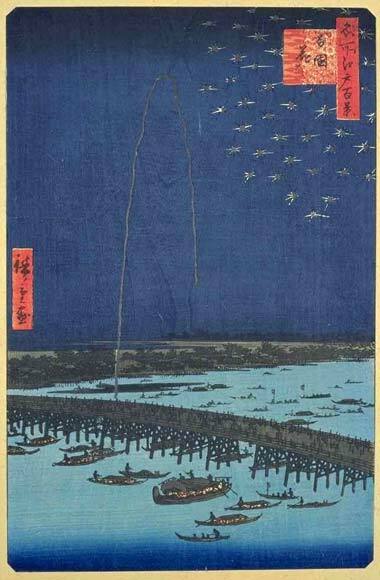 it is also suggested that this hiroshige print, 'fireworks at ryogoku' inspired whistler in these images as it would nordfeldt in 1906.
the whistler painting itself was inspiration for the next generation of japanese printmakers. 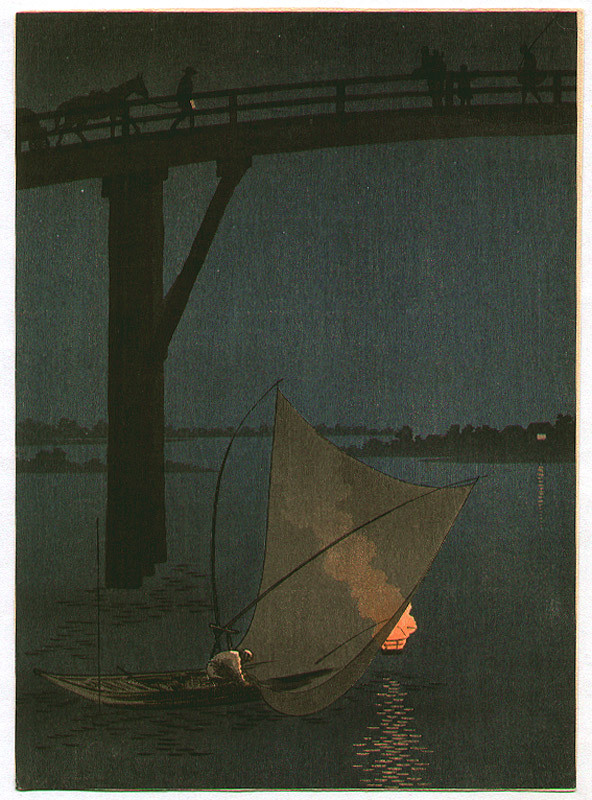 'misty bridge at night' was done by an anonymous printmaker in the 1930s, the same decade that yoshimune arai produced his 'fishing boat,' (right) . what is called 'the aesthetic movement' intrigues me. it's primarily an 'anglo' phenomenon, ie great britian and the united states. 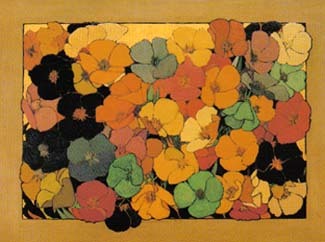 and in part, it flourished in the us because of a brit (who was wilde). 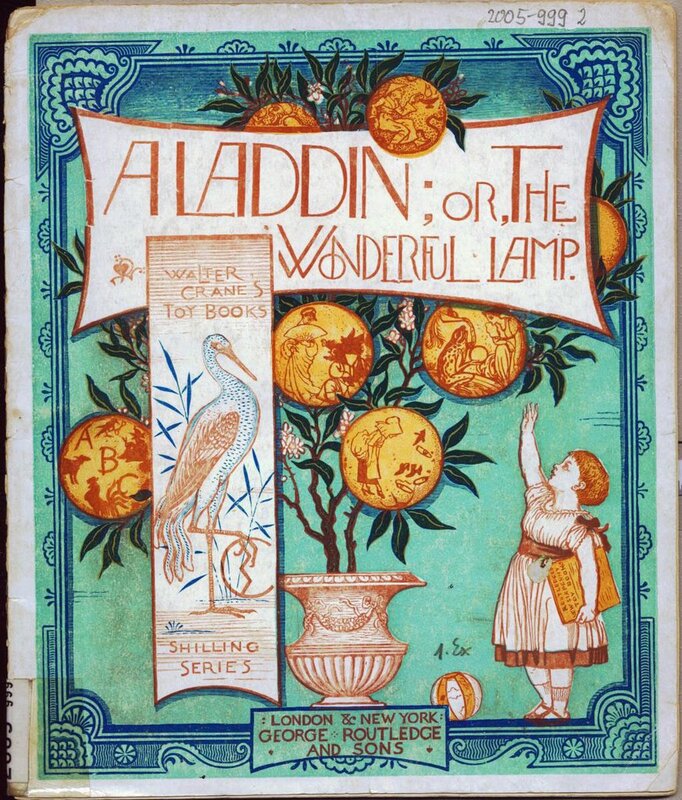 it does get complicated when one begins to discuss personalities, with wilde, ruskin, whistler, and more, and i do want to get into that--it's fascinating. but for the moment let's look at these artifacts. 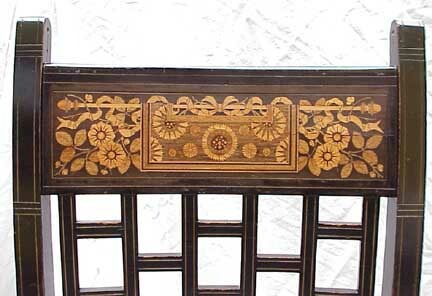 have, essentially, victorian design with japanese symbols (fans, cranes, the japanese symbol for the chrysanthemum's) on it. none of the fluidity of line and form that would enrich the world of arts in the next few years is yet seen, and yet... it's really interesting. 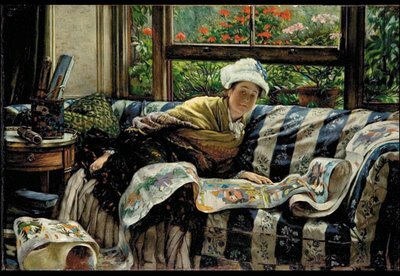 while he is less well-known than his two close friends manet and degas, james jacques tissot gave us something important in these two of his paintings: the dawn. while all three artists were avid followers of the japonisme craze, none of the the three featured the work in their own as much as did, say, whistler, monet or van gogh. much of tissot's work was of upper-crust society, the wondrousness of costume, the vapidness of content, and of the love of his life, a one mrs. newton (divorced) with whom he lived for only 6 years until she died of a consumptive suicide at the age of 28 (after which tissot spent the rest of his life painting some 700 illustrations of the bible). still, in much of it one sees the strong diagonals of the japanese prints. and to the extent that the japanese prints often featured ladies in the latest extravagant fashions, perhaps this is a corollary as well. 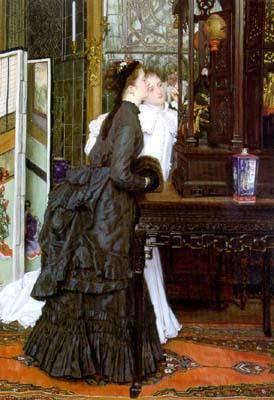 further, upon occasion tissot (as well as his friends) would sneak a hung-on-the-wall example of ukiyo-e into a portrait. 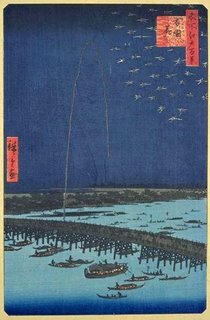 but i don't recall any other painter offering us a glimpse into that moment of discovery: the first sighting of lady liberty over the bow of the ship, as the west discovered the wonders of the east. 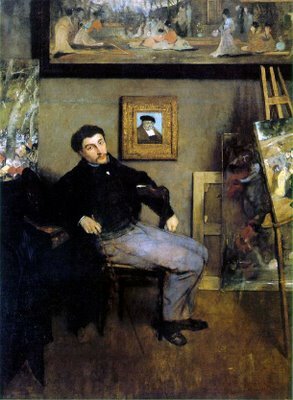 in one description of degas' portrait of tissot, it said that it was tissot's own 'ukiyo-e' that hung on the wall behind him, but i could find no other reference to it. i am very lucky, living in california, for many reasons, including its having been an area of great creative activity during the 'arts and crafts movement.' 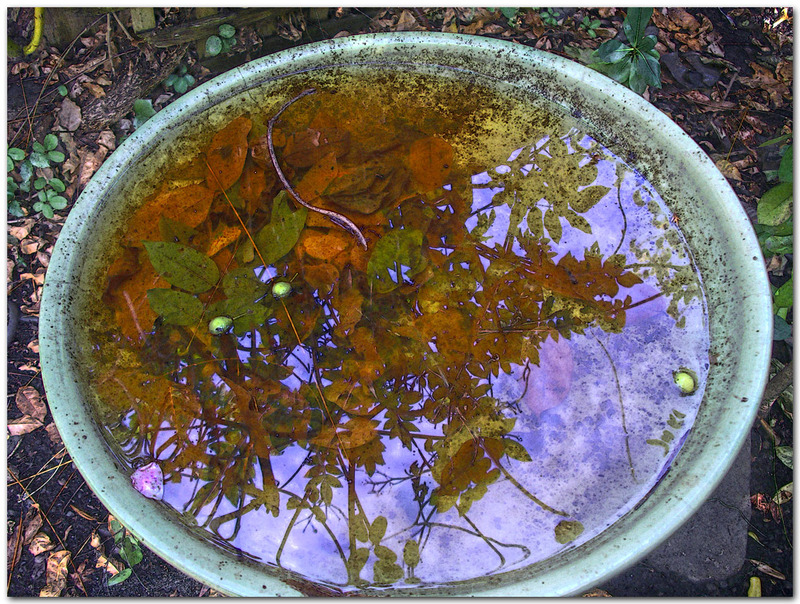 i put that in quotes because there is a tendency to block off all of these 'movements' into separate parts, as though they were truly distinct, without their tendrils and roots all tangled together, which of course they were. in barcelona, they were called 'modernistas'! whatever they were called, an exhibition honoring them will be happening at the cleveland museum of art from october 15th 2006 until january 7 2007 (and from march 5 2007 to june 3 2007 at the metropolitan museum of art in new york). 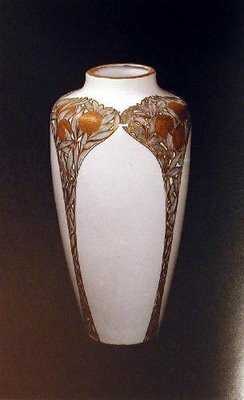 on the cma webpage i found this vase. created in 1907 by antoni serra, one of catalonia's leading 'modernista' ceramists, this vase reminded me of something. i think this is a huge and wondrous coincidence, because when i looked at that vase, i immediately thought of arthur and lucia mathews! the colors, the oranges, the leaves, these are exactly what you see on some of the work of the mathews, and i realized again how strongly what you find on these arts is what you find where they are made. this is why there are individual temperaments in the "different" movements, not because they are different, but because they are so wonderfully diverse.